2 Timothy 1:3-5 "A Mother's 'Migrating' Faith"
2 Timothy 1:13-18 Courage: Am I Willing to Pay the Price? See Caveats regarding Barclay's theology which was not always orthodox. This resource is listed because he gives some excellent background and helpful word studies. 2 Timothy 1 Fan into Flame! D Edmond Hiebert - A concise, conservative, phrase-by-phrase interpretation by a missionary in India who understands the positions of Timothy and Titus in the light of his own missionary experience. 2 Timothy 1:12 Can God Really Keep You Saved? 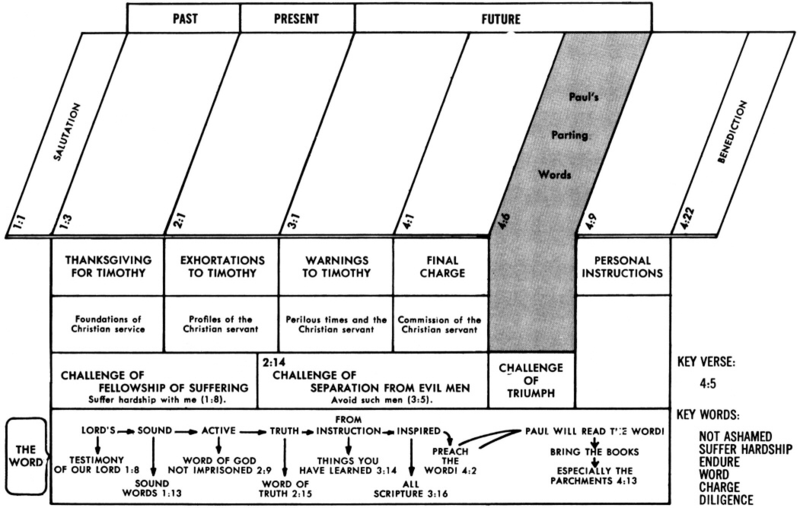 2 Timothy 1:1-7 - Below are examples of the type of illustrations frequently found in his sermons. Warren Wiersbe - “Years ago, I read about a Christian who was in prison because of his faith. He was to be burned at the stake, and he was certain he would never be able to endure the suffering. One night, he experimented with pain by putting his little finger into the candle flame. It hurt, and he immediately withdrew it. “I will disgrace my Lord,” he said to himself. “I cannot bear the pain.” But when the hour came for him to die, he praised God and gave a noble witness for Jesus Christ. God gave him the power when he needed it, and not before.” Beloved, there are going to be times when we go through difficulty. Don’t be surprised when trouble hits. Learn to lean on the power of the Holy Spirit. 2 Timothy 1:9 Why Suffer for the Gospel? 2 Timothy 1:5 Who were Lois and Eunice in the Bible? 2 Timothy 1:7: What does the Bible say about fear? 2 Timothy 1:13 Why is sound doctrine so important? 2 Timothy 1:16 Who was Onesiphorus in the Bible? 2 Timothy 1:1- 7: Is There Room In Your Family For God? 2 Timothy 1:1- 7: What Has God Given You? 2 Timothy 1:5- 7: Will Your Circle Be Unbroken? 2 Timothy 1:15 – 2:7: Who Will Pass It On? D Edmond Hiebert - Oosterzee, J. J. Van, "The Pastoral Letters," J. P. Lange's Commentary on the Holy Scriptures. Translated from the German. (1863). The abundant material is in three sections: exegetical and critical; doctrinal and ethical; homiletical and practical. A full evangelical treatment by a Dutch Reformed minister and theologian of the past century. D Edmond Hiebert - Uses author's own translation. A scholarly, conservative work giving a comprehensive discussion of the Pastorals as a group as well as the individual epistles. A verse-by-verse exposition characterized by spiritual warmth and practical appeal. Cyril Barber - This "first century message to twentieth century pastors" is a work of rare merit, and we welcome its reappearance. Rosscup - This work, with that of Bernard among older efforts, deals with the Greek text in a thorough manner and offers the student much help. It is one of the more valuable commentaries on the Greek. D Edmond Hiebert comments that this work is "Marked by careful scholarship, spiritual insight, and reverent faith. One of the outstanding volumes of the series. Appended is a long poem by the author on the martyrdom of Paul. 2 Timothy 1:3: Who's Praying? 2 Timothy 1:10 Who Will Tell Them? 2 Timothy 1:10: Fear or Faith? 2 Timothy 1:12.Christ Is Able! 2 Timothy 1:16: Be A Friend! 2 Timothy 1:12 Can God Really Keep Me Saved? 2 Timothy 1:7 The Spirit of vital Christianity. 2 Timothy 1:1-7 Mindful Memories. .
2 Timothy 1:8-18 Ashamed or Not?.